Not only is she running for president, but she is also fashion. I think she is wearing the dress backwards. This summer: fashion week in Paris specializes in everyone running for US President. Democratic and GOP collections to be pitted against each other. 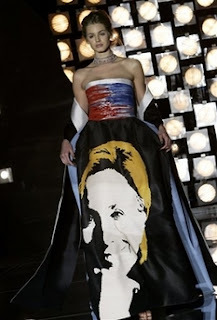 The Nader gown, however, is getting all the attention...one wonders how it is staying up. :) Good find, Paul Cat.